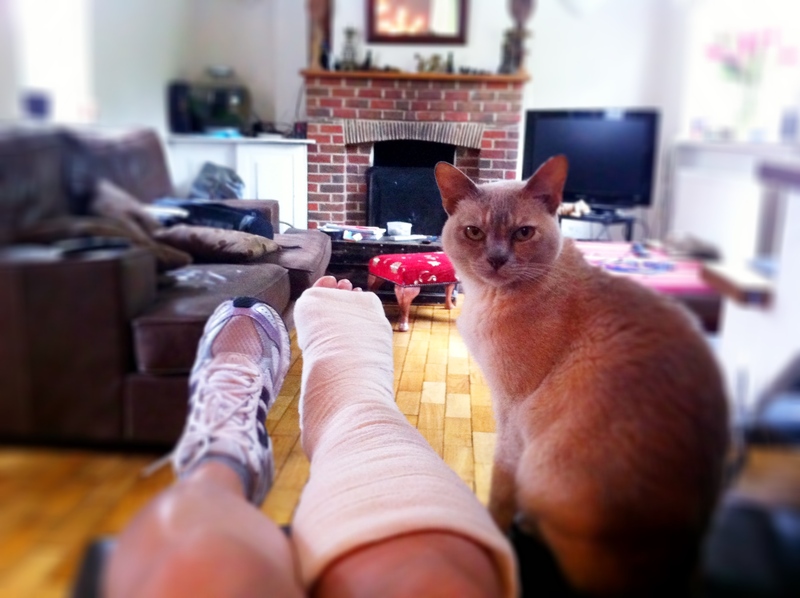 My very sceptical looking cat keeping me and my temporary cast company on Monday morning. When I was growing up, I always wanted to break a limb, ideally my arm. It had nothing to do with wanting broken bones and everything to do with wearing a cast. Well, at 40 years of age, I finally got my wish, didn’t I? My careless slip in the rain last Friday resulted in 3 hairline fractures on my right metatarsal. After being put in a temporary cast on Friday, I pretty much spent the weekend doing really not much at all. Perhaps I was still in shock on Saturday, but the ‘doing nothing’ bit wasn’t that bad, quite relaxing and fun in fact. However, by Monday morning, after 2 uncomfortable days in bed unable to sleep properly because of the cast, unable to even sit up to use my laptop, the novelty of having broken anything was wearing really, really thin. 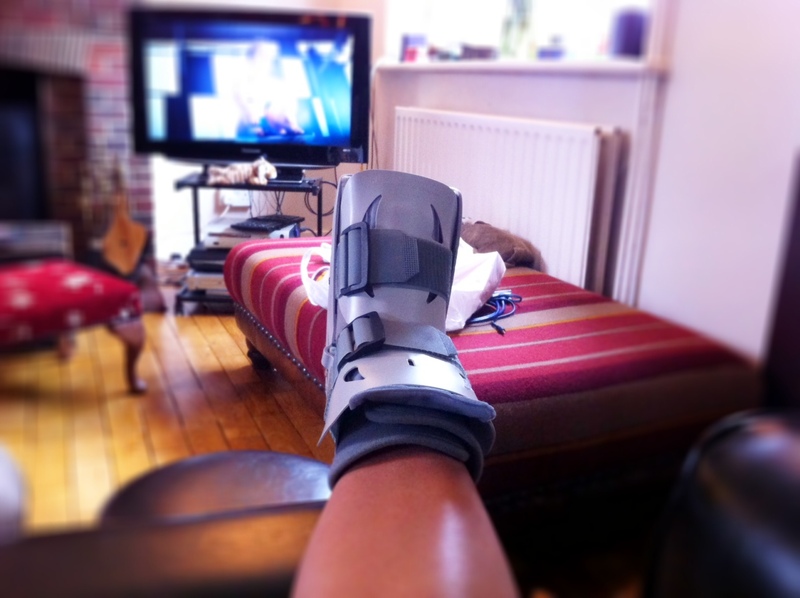 The thought that I might need to be in a fixed cast for a further 5-6 weeks was starting to fill me with dread, so imagine my relief when, on Monday, I found out I simply needed a funky inflatable boot to wear for the next 6 weeks, wooo hoooooo! What’s quite pathetic is realising how three tiny hairline fractures can cause so much pain; seriously, I wouldn’t have been able to see them if the doc hadn’t pointed them out to us. On the flip side, what is amazing is how quickly my foot’s recovering too. After the first painful few days, I’m today back up and walking around again (without crutches most of the time too), and the walking is getting easier every day. As long as I’m careful, life can start getting back to normal. More importantly, our holiday plans to Canada & the US can go ahead, phew! I think some of my colleagues are quite disappointed though, some of them were really looking forward to decorating the cast but instead of permanent marker pens, I suspect my removable boot will simply end up being adorned with stickers instead. Sitting at our kitchen counter getting ready to make the pancake batter. Stuck at home but unable to cook, grrrr! What has been frustrating this week though has been being at home and not actually being able to cook properly. Earlier in the week when I still needed to use my crutches for support, I made some pasta and suddenly realised I wouldn’t be able to drain the pasta because I couldn’t hold the sieve, pot of boiling pasta and my crutches at the same time… I ended up having to sit the sieve in the bottom of the sink and used one hand to carefully pour the pasta through the sieve in the sink. My husband has obviously been a superstar, given that he basically had to do all the cooking and washing earlier this week. One whisk. One bowl. Simples. So being able to sit in a chair in the kitchen today to make something from scratch has been deeply satisfying, and what better comfort food can there be other than pancakes? Everyone has their own pancake recipe. 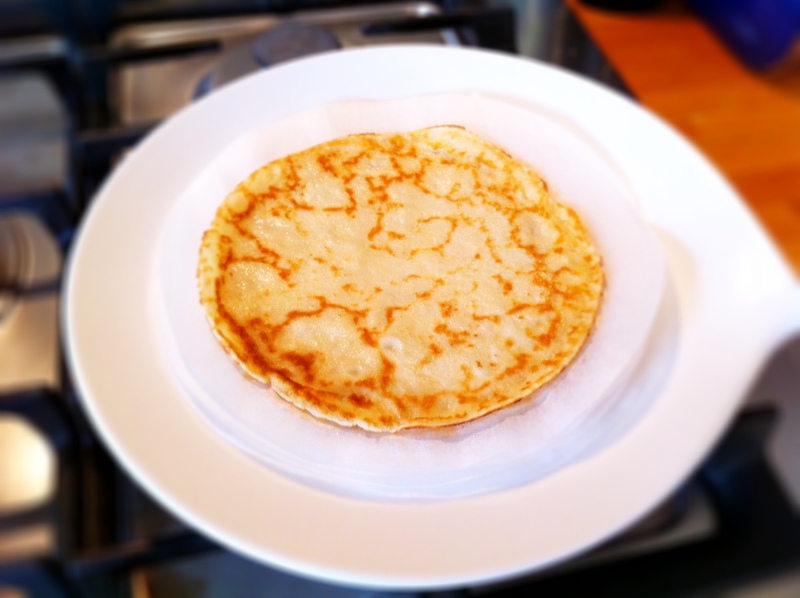 I love the fluffy American style pancakes and I love French crepes, but I have to say that I think English pancakes are far superior to both – thin enough to get crispy edges like a crepe, but denser so you have something you can really sink your teeth into. Every day really should be pancake day. 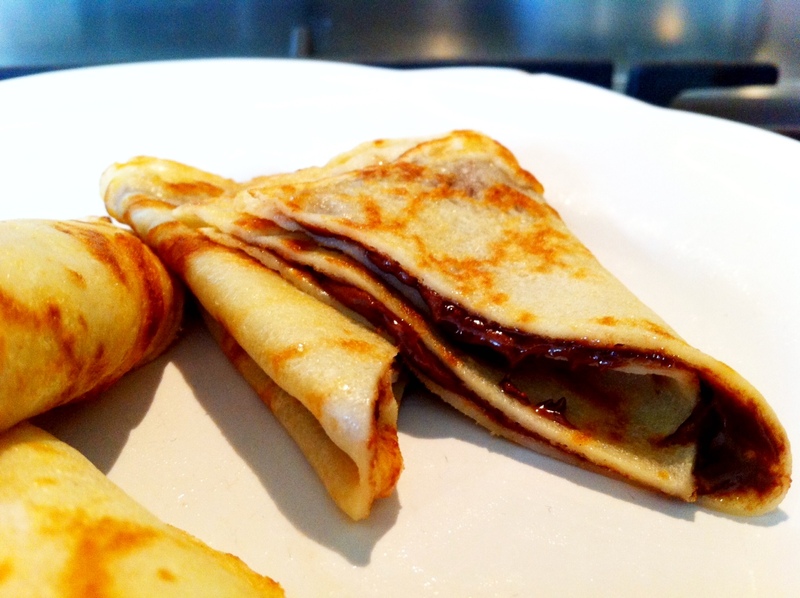 There isn’t anything you can’t eat with a pancake, and if I’m not doing savoury fillings, I stick to two favourite sweet treats – one with nutella, and the other with castor sugar and freshly squeezed lemon juice. Pancakes. One of the best comfort food around. Having been laid up most of the week, I haven’t been round to visit but I do hope you’ve all been well. It’s yet another dreary, wet and cold summer day in England, so now filled to the brim with pancake, I’m climbing back into bed to rest my foot and find a cheesy movie to watch on the box. 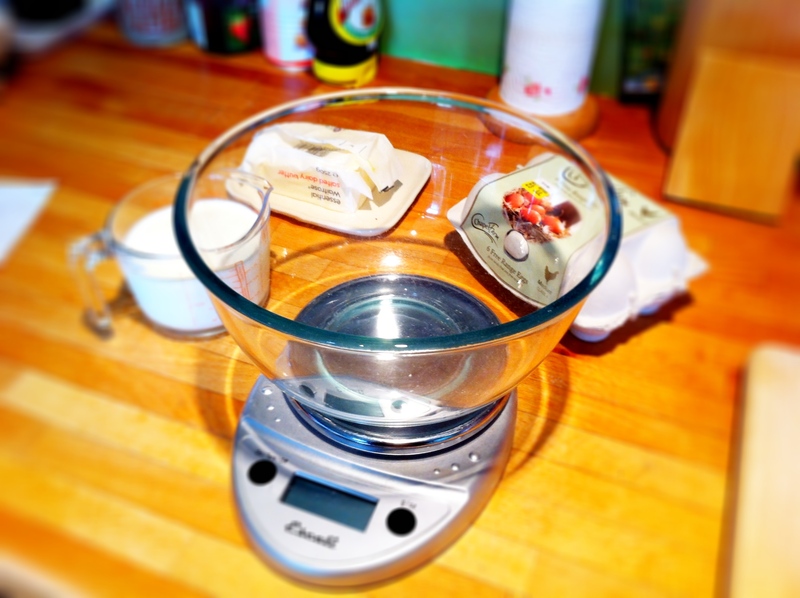 In a mixing bowl, sift your flour (holding it up high so you get lots of air through) with a decent pinch of salt. Make a well in the flour and crack in your eggs. 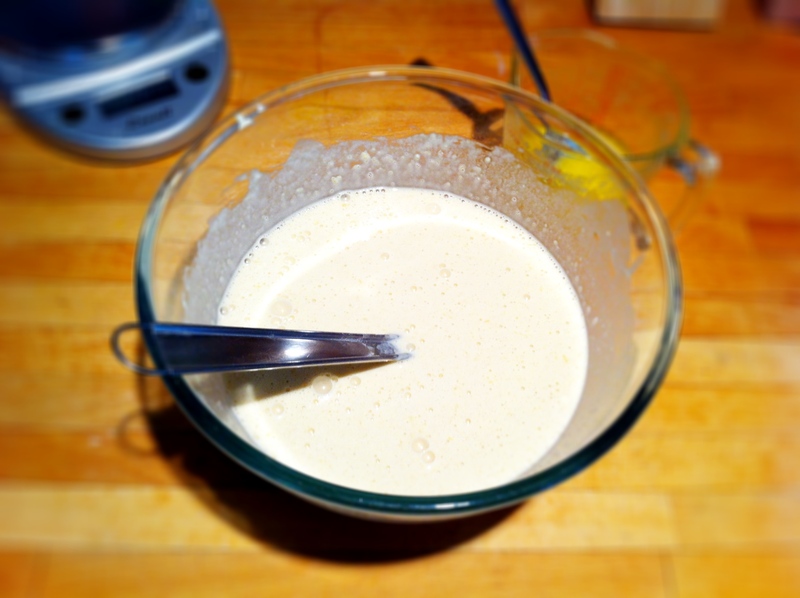 Whisk the eggs and flour together, and slowly add the milk a little bit at a time, and whisk until you get a batter with the consistency of a thinnish cream. If you like thinner pancakes, add more milk, if you prefer it thicker, either add another 10-20 grams of flour or reduce the amount of milk you use. When you have a batter with no lumps, add 2 tablespoons of melted butter to the mixture and pop your batter into the fridge for at least 20-30 minutes. To make your pancakes, lightly grease a non-stick fry pan with some melted butter and ladle about ¼ cup of batter for each pancake. You’ll know your pancakes ready to flip over when you shake the pan and the pancake starts to slip around the pan. Eat them with whatever fillings you like, savoury or sweet! I have never had English pancakes, but yours look beautiful however you fold them. I have had fifth metatarsal fractures (no fun, but a good time to catch up on your reading, knitting, listening to music). If you have trouble sleeping, try an ice pack behind the knee of the injured foot — it chills the blood supply and will make you more comfortable (learned that trick from my sports doc). Thanks FF. I should have said I wished I could have pancakes every day, they are very naughty! For some reason, when I was a kid I wanted to have braces. Bizarre, I know (now). Your pancakes look wonderful, as does the cat! Glad to hear you’re on the mend. So sorry to hear about your break…maybe you’ve gotten the cast thing out of your system, now? Glad you can still do your holiday, and I love the flat little rolled pancakes. They look like so much fun to make and eat! You cat has that cat expression like: you’re in my spot! These look scrumptious! Yes, everyday should be a pancake day! I do agree with your title..every day should indeed be pancake day and your pancakes look amazing! I can’t say that I recall wishing for a cast when I was young, but my BFs daughter wanted crutches for her 11th birthday. Strange but true. My Mom’s BF was English and she made us these pancakes years and years and years ago. They were SO DELICIOUS. I had forgotten about them, thanks for the reminder of such a tasty dish and a wonderful lady (sadly she died of Cancer in 1985). 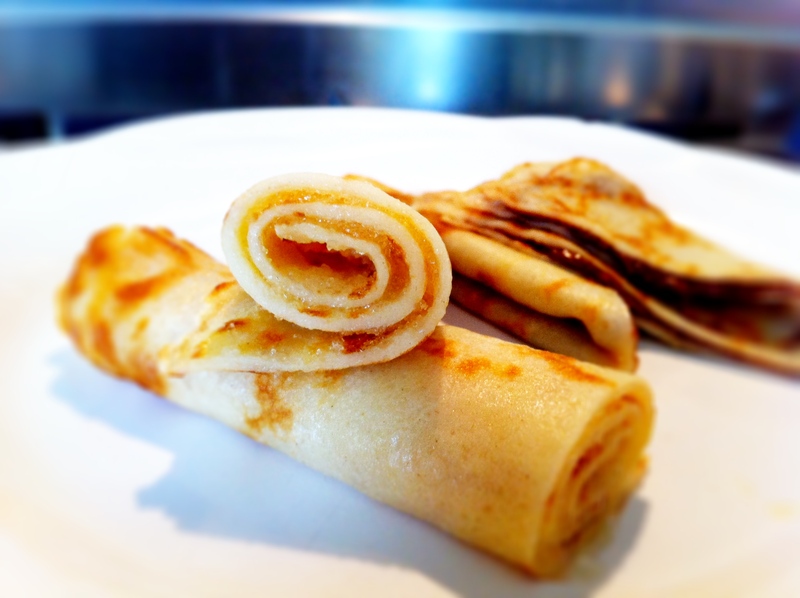 I think pancakes are one of the most versatile foods – love how you can do so many varied things with them. Would also love to try the English version you speak so highly of – sounds delicious! Hope your foot continues to heal quickly! As I read your post, I started with a smile about kids with casts at school and then moved onto the ouch bit and the awww sympathy bit. And then I did the cheering and love th eidea of the stickers. 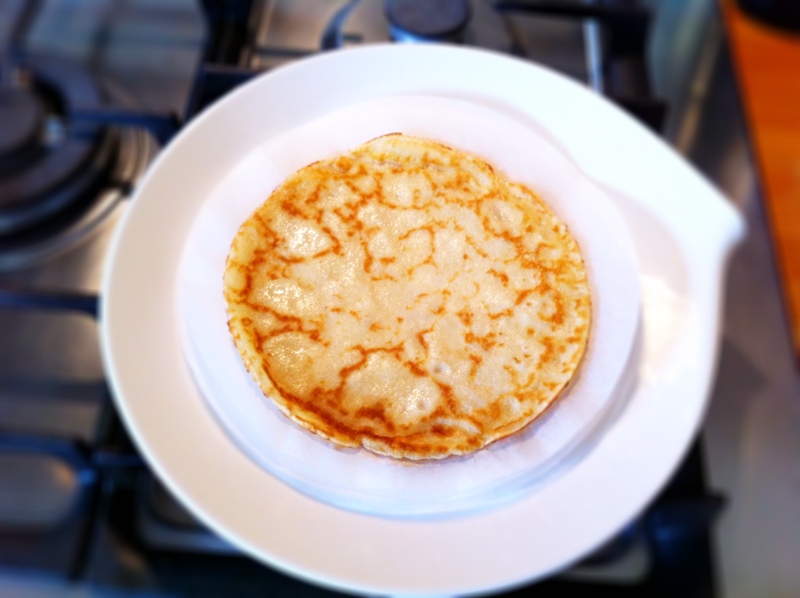 And English pancakes (I’ll have mine rolled with lemon and sugar too) way to go Noodle! Take it easy though, and don’t do too much but I know how frustrating it is to be out of action and relying on others. Hope the film was a good ‘un! I love pancakes! I whipped up a baked pancakes “pancake squares” the other day and it was awesome not to have to stand over the stove and flip ’em. I think your “pancakes” are more like crepes to us here, but gorgeous nonetheless!